Visiting Bottega Antonio Manta in Montevarchi, Italy was, for me, a defining experience. Antonio and his small team hand-crafts Platino/Palladio prints for some of the leading photographers and museums. I instantly fell in love with the idea of hand-crafted images. In a way it is taking back photography to its roots, where every practitioner can manifest his or her own personal style. As soon as I was back in Doha, I started researching about hand-printed images. 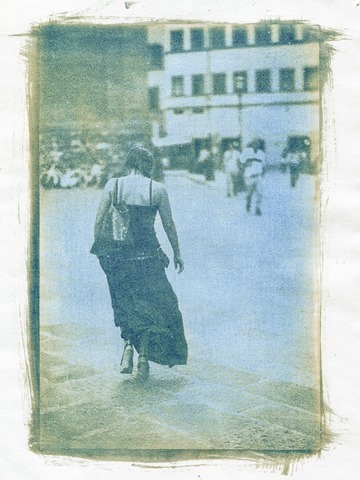 I spent the weekend creating a Cyanotype image and the result is posted here. I did a few more runs using different papers but the first image seems to be the best yet! There are too many variables to control – mainly sunlight intensity, exposure times and emulsion thickness. I am now planning to build a UV contact print frame and continue the experiments under a more controlled environment. So glad I subbed to this blog. Thanks Walter. Yes it has a retro and nostalgic feel to it.